Keep up with the latest TLC Tysons Corner news here. You'll find Affiliate announcements, press releases, and other important information that can help you build your refractive surgery co-management practice. If you have an important announcement that might be of value to other Affiliates and would like to have it shown here, just email me, your TLC Tysons Corner Clinical Director, at jen.weigel@tlcvision.com. I would like to formally acknowledge my heartfelt appreciation for Joan Reich, my Affiliate network right hand and one of TLC’s first Professional Relations Consultants for the optometric community. Her 24-year career educating countless medical professionals about laser vision correction is to be respected by us all. 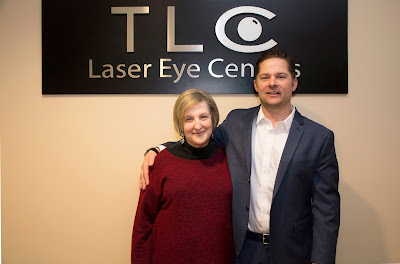 Joan was instrumental in making the TLC DC-Metro region one of the largest and most vibrant laser vision correction optometric networks in the USA and Canada. I want to thank Joan, as I’m sure you do also, for her years of unparalleled service. Joan authentically cares about her network of doctors and the genuine relationships she has built over the years. Our TLC family will surely miss Joan’s constant presence in the office and in our network outreach. If you want to send well wishes to Joan, she can still be reached at jreich@tlcvision.com or 301-346-2333. I am also pleased to announce that we have a new TLC Tysons Professional Relations Consultant Nick Oettinger. Nick joined our team in March 2018, and he has been quite enthusiastic to learn his new role. You all will have an opportunity to meet Nick soon, and I am sure you will come to trust him for your TLC Tysons needs. He has an accomplished professional background in sales as well as eyecare. You will find that he is quite personable, making it very easy to get along with him. Initially, he will be working directly with Joan to learn the subtle nuances of our Affiliate network, and then he will transition to being your primary contact for TLC Tysons. I am confident that Nick will help you and your practices get to the next level with vision correction. He can be reached at noettinger@tlcvision.com or 703-727-8445. Thank you for all of your support over the years with refractive procedures and your continued support moving forward. We couldn’t be what we are today without your help. Please join me in welcoming Nick to your practice as we wish Joan our best as she retires. You are invited to a CE given by Drs. Andrew Holzman and Dr. Jonathan Solomon on "Inlays and Beyond" (COPE approved for 2 hours). You have a choice of dates and centers: Thursday, December 3rd in our Tysons Corner Center, or Wednesday, December 16th in our Rockville center. Both start at 6:30 with registration and a light dinner. The presentation, will start at 7:00 and See the attached invitation. For those of you who were told ahead of time, please note that the date of the Tysons CE has changed! * TYSONS: Just reply to this email (joan.reich@tlcvision.com<mailto:joan.reich@tlcvision.com>) no later than Monday, November 30th. * ROCKVILLE: Reply to Kara Kline (kara.kline@tlcvision.com<mailto:kara.kline@tlcvision.com>) no later than Friday, December 11th. Please be prepared to give us your OE Tracker#, if you haven't done so already. COPE will only accept credits uploaded to their website and will require this number to identify you. If you do not have this number, please go to the ARBO/COPE website. As long as you are a registered optometrist in the state you work in, you will be able to find it there. If you have given this # at a previous CE, we will not need it again, as I have recorded it in my database. TLC Rockville is located in the CRI building directly across the street from White Flint on Rockville Pike. The entrance to the garage is on Edson Lane. TLC is on the lobby level. We are changing the soft contact lens discontinuance protocol. Basically, we are rolling things back to what things were like pre-Custom VISX days, so this is not as radical as what it might seem at first glance. Patients can see you at any time - no matter their cl discontinuance time - for their pre-LASIK/PRK vision checks, dilation, but they must discontinue cls according to the new contact lens protocol above before their TLC pre-op appointment. And, it goes without saying, but this protocol does not replace professional judgement. If your patient requires more time out of contact lenses, we will explain this to your patients at their consultation appointments. Examples of cases needing extended cl discontinuance might include dry eyes, irregular scans, fluctuating MR.
TLC Tysons Corner is pleased to announce that Kara Kline has joined our team as a Professional Relations Consultant. In her role as Professional Relations Consultant, she will be the liaison between your office and TLC. Kara joined us on September 8, 2015, and she has been working diligently in preparation to meet all of you. Kara graduated from Indiana University with honors and served as a medic in the United States Army. While in the Army, she performed administrative, clinical and office management duties to support medical professionals, patients and clients for several large medical facilities, including Walter Reed Medical Center, Brooks Army Medical Center and Heidelberg MEDDAC. She came to us from McKesson's Medimart Division where she was an Account Manager and Field Support Specialist. We are very excited to have her on board as a member of the TLC Tysons team. Please help us welcome her as she visits you and your practices soon. If you would like to contact Kara, her email address is kara.kline@tlcvision.com<mailto:kara.kline@tlcvision.com>. This is a quick update on our surgery protocols involving the use of Muro-128 ointment. You likely have noticed we have been using this preoperatively for a few years. This originated from Dr. Holzman's research using hyperosmotic agents to reduce epithelial disruptions during LASIK. Epithelial defects can put the patient at risk for ingrowth, DLK, prolonged healing and undercorrection. 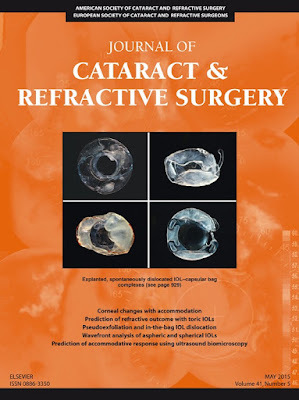 Attached is Dr. Holzman's article which recently was published in the May issue of Journal of Cataract and Refractive Surgery. This is the first study of its kind investigating this issue. * Age (>34yo) was shown to be the most significant risk factor for epithelial defects during LASIK. * ​Use of preoperative hyperosmotic ointment reduced the incidence of epithelial defects during surgery. Therefore, we have all patients over 35 years of age use Muro-128 ointment at bedtime one week before surgery. Also patients with very fair complexion (i.e. red hair, Rosacea) are placed on similar protocols. These instructions are provided to your patients during their consultation at TLC. While impossible to prevent every surgical complication, our team is committed to maximizing patient safety. We feel the use of Muro helps us achieve this goal. As always please contact me or Dr. Holzman (andrew.holzman@tlcvision.com<mailto:andrew.holzman@tlcvision.com>) with any questions. Hopefully all is well with you and your summer is busy with patients. I am writing this note to share some news with you. Nicole Lowry, one of our Professional Relations Consultants (PRC) in the Washington DC area will be leaving her role with TLC. She has done an outstanding job, has built up strong relationships with many of you and your staff, and will be greatly missed. She will be pursuing an opportunity in an unrelated field, and we wish her the best! We are recruiting now, and will work to find the best possible candidate to fill the position. In the meantime, please feel free to reach out to me, or to any of the center management teams listed below with any needs or concerns. In addition, if you know of anyone that may be interested in the position, or anyone that you feel we should approach please let us know! As always, thank you for your continued support and for trusting your patients to Dr. Holzman and TLC Laser Eye Centers! My apologies for the late notice! Since this course is only 2 weeks from now, please RSVP ASAP! Just reply to this email. Thanks! TLC Tysons Corner will be resuming our CE series on Monday, May 18 with an exciting program featuring Dr. Jonathan D. Solomon, our Director of Refractive LensBased Surgery. He will be speaking on pre and post-op management of ICL and Cataract Patients. The 2 hour course is pending COPE approval. The invitation and directions to the center are attached. As always, we will begin at 6:30 with registration and a light dinner, and the lecture will begin at7:00. As those of you who regularly attend our CE events already know, they fill up very quickly, so please RSVP now. Congratulations on Your Promotion, Natasha! Please welcome Natasha Carter as our new TLC Tysons Corner Center Manager! I have had the pleasure of knowing Natasha for the last six years. She has always been a stable force in any work environment that we have been in together. She is a wonderful brainstormer, always coming up with great ideas that have helped me in the Center and with many other activities outside of the office. Natasha brings a great knowledge of optometry, laser vision correction, and more specifically, the daily management routines of our Center. She is promoted from Front Desk Manager where she has served us for the last two years. She has a BS degree in Business Management, a wonderful family, and the cutest dog (I love it when she has her pink bow).